I am Transformation and trans-mutation. The Count of Saint-Germaine is undoubtedly one of the most enigmatic characters from history. Considered by many to be either immortal or continuously reincarnated, he survives in all accounts as a great mind, an alchemist, and a Rosicrucian. The first supposed incarnation of the Count of Saint-Germaine is that of a High Priest of the Violet Flame temple, over fifty thousand years ago. It is said that he brought enlightenment to the people of that culture, bringing to them the concept of the cosmic consciousness. Several lifetimes followed until he was later born in 1710, he was the third son of Prince Ferenc Rokoczy II of Hungary and an unknown woman. St. Germaine is here working with his twin flame, Lady Nada. He uses his alchemy skills to cleanse the body, mind and spirit. He works with the third eye to envelope the higher aspects around psychic abilities to unveil and find the clarity that is needed. These are removing the seven veils of illusion. He connects with the Temple of Transmutation in Atlantis with Lady Nada. They have both developed the great power of the Gold & Silver, Violet Flame to remove dross from the spirit through Soul and Higher Self and the mighty I Am presence. 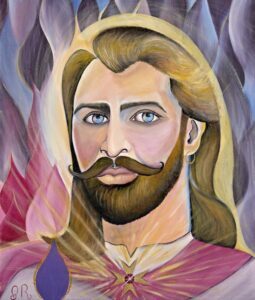 The painting of Saint Germaine is surrounded in his Violet Flame. Focus on the painting and feel the vibration of the flame, transmuting and transforming you into Mastery.